No one gives animals a voice like author Richard Adams. 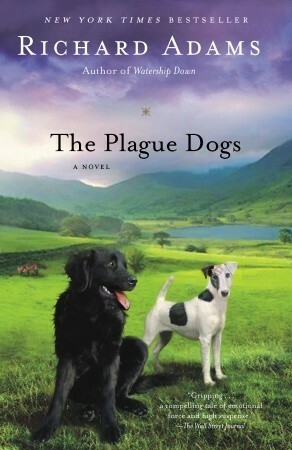 While most may be familiar with his novel Watership Down (1972) from childhood, readers of EcoLit may especially appreciate The Plague Dogs (1977). Adams credits Victims of Science: The Use of Animals in Research (1975) by Richard Ryder and Animal Liberation (1975) by Peter Singer as influences for this book, which tells the story of two dogs’ escape from an animal research station in North West England. The omniscient narration allows Adams to delve into numerous perspectives most notably the dogs: Rowf, a loyal eager-to-please Labrador to the core, and Snitter, a prescient fox terrier who has undergone brain experimentation and acts a lot like Fiver, the mad rabbit in Watership Down. The book also explores the motivations and personality of the researcher Dr. Boycott: “He represented, in fact, a most ingenious paradox, noble in reason, express and admirable in action, his undemonstrative heart committed with the utmost detachment to the benefit of humanity. Something too much of this.” and “Besides, who in his senses could reasonably expect Dr. Boycott to ask himself, on behalf of the human race, not, ‘How much knowledge can I discover?’ but ‘How much knowledge am I justified in seeking?'”. It’s an affecting and memorable book, and worth reading if only for the opening scene which describes Rowf’s experience in a water experiment. He’s made to tread water until he drowns and is then revived — repeatedly. The horrors of animal testing are tough to confront. These experimental animals are just sentient objects; they’re useful because they are able to react; sometimes precisely because they are able to feel fear and pain. And they’re used as if they were electric light bulbs or boots. What it comes down to is that whereas there used to be human and animal slaves, now there are just animal slaves. They have no legal rights, and no choice in the matter. Fiction provides a buffer that makes these animals’ experiences approachable though no less heartbreaking and based in fact. Fiction evokes empathy without triggering our instinct to recoil. Although Adams adds political intrigue, the story bogs down in the middle as the dogs roam the countryside. It gains momentum with the appearance of an old-school, investigative, rabble-rousing journalist, Digby Driver: “Privacy, reticence and human worth melted before him like ghosts at cockcrow.” The novel explores all the influences that permit animal research and shows how this torture survives only in shadow. The dogs’ conversations about their prospects for survival are heart wrenching. Snitter, who once had a “real master,” sticks up for men, while Rowf despairs. He feels he is being punished for not doing his duty as a dog (withstanding torture). Snitter notes, “Men can do worse things than hurt you or starve you—they can change the world.” And not for the better, the dogs conclude. Beloved canine companions may find themselves the recipients of extra hugs and treats during the reading of this book. However, there’s a reward for readers of EcoLit who persevere — the appearance of a real-life hero. Environmentalist Sir Peter Markham Scott (1909–1989), knighted for wildlife conservation and a founder of the World Wide Fund for Nature, makes a cameo. While several stylistic choices limit this book’s appeal, it’s classic, heartfelt EcoLit with intellectual chops. It’s time people started thinking of Man as one of a number of species inhabiting the planet; and if he’s the cleverest, that merely gives him more responsibility for seeing that the rest can lead proper, natural lives under minimum control. We3 (2005), a graphic novel by Grant Morrison, evokes some of the same emotion and ideas as The Plague Dogs in a greatly condensed and visual form. It features a weaponized cat, dog, and rabbit who escape from a government defense research facility. Notably, Morrison is the author of Animal Man, a comic book released in omnibus form in August, with strong animal advocacy roots. Victims of Science: The Use of Animals in Research (1975) by Richard Ryder and Animal Liberation (1975) by Peter Singer influenced this book and Pincher Martin by William Golding, a novel about purgatory and drowning, is referenced within. Visit the Beagle Freedom Project. A reader, writer, and @Utopianista living by the Salish Sea, Shel served in the Peace Corps and earned her MFA in Creative Writing.